Translating complex tax law into language and contexts that are easy for clients to grasp is a skill that Trung Vu relishes, and one that sets him apart. Trung appreciates the complexity of tax law and the need for his clients to see a clear path through the maze. 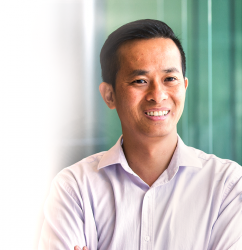 With previous roles at the ATO, Trung knows Australian tax inside and out. He uses this key insight to ensure the tax system is working for his clients, not against them. “We have the confidence to go back to the client and say we’ve looked at all the options. We can tell our clients we’ve got the right option for them." Trung’s day-to-day involves analysing the tax considerations for his clients’ business structures and transactions. His career highs come from saving clients substantial tax dollars, including the restructure of an accounting practice to meet the client’s objective of selling part equity to junior partners, with no capital gains tax plus increased reset cost base asset deductions. In work and in life, Trung strives to stretch himself and his limits. It was the challenge of treading unfamiliar ground that drove him to study law, and it is the challenge and thrill of high adrenaline activities such as bungy jumping and riding an R6 street motorbike that he seeks out in his spare time. I turn complex laws into everyday language.